I have 3 blueberry bushes in 5 gallon pots with wood chip mulch that are doing great and blooming pretty heavily right now but I've heard they like acidic soil. Should I be adding coffee grounds, or pine mulch on top of these or using an acidic fert? I have an established pomello tree with three main trunks that produces heavily. Unfortunately, it overproduces and I'm not too crazy about eating a pomello every day. I'd like to graft some other varieties on 2/3 of the main branches. What kind of citrus could I graft on to this tree and would a bark graft work to add to each (3-4inch) branch? Ideally I'd like to have 3 coming off each branch. secondly, where would I source these in northern california? Does anyone have any good varieties for sale? 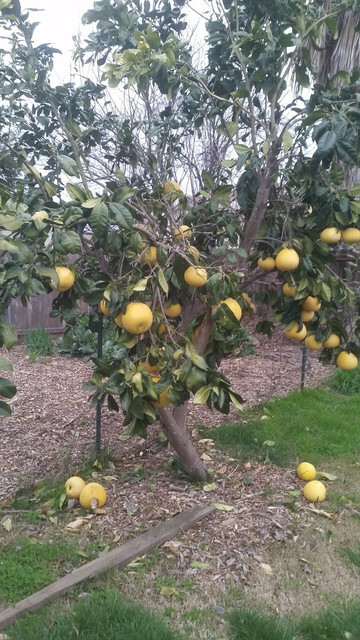 I have a large pomelo tree growing in my back yard but no clue what variety. It most closely resembles 'thong dee' to me from pictures. I forgot to get a picture of the inside of a fruit but I'll post one later. The fruit is light pink with very thick rind. Please let me know what you think it is. Thanks. Where does everyone get their tree pots? I have yet to try locally, but I'm looking for some tree pots for some cherimoyas and moringas. I'll be calling my orchard supply today but I was looking around online and have not had much luck finding any without a hefty shipping fee. Preferably the pots should be re-usable as I hate just using a pot once and it falling apart.. I just wanted to know your personal recommendations on pruning tools. I'm in need of some tools and wanted to know what you guys recommend. I have some overgrown citrus and persimmons to trim as well as a shade tree in my front yard. as a side note I will be getting a Ryobi 12in 18v chainsaw, has anyone tried this out before? I have only .2 acres and already own multiple ryobi tools so this sounded the most conveniant. What's the best removal method for cushiony cotton scale? I got rid of alot from my naval orange in the spring with rubbing alcohal and removing some severely infected areas, now I have some on my pomello tree. I was wondering if anyone has experience growing passion fruit's close to other passion fruit vine. Could you please share your experiences? Does it work OK or do they strangle each other out? These are growing on two 16ft cattle panel tied to 10 ft t posts in a straight line. Volume isn't a huge deal for me as it's mostly just myself who enjoys them. Just wondering what kind of bananas would do well in my area from other peoples experiences. I have an unknown variety that flowers but doesn't produce. It's also about 15ft tall... I plan on ripping these out and replacing them with some quicker producing bananas to give them a try. They will be planted near my Stucco wall for some extra warmth. Currently my really tall bananas get a bit of damage from the wind as they are taller than my house but mostly protected by the house/fence. In winter the leaves die back but regrow quickly in spring. TL;DR which bananas would you recommend I try in norcal, 9B? I want to try tastier varieties, as well as some easier to grow types. I'm somewhat interested in the varieties below, but what's your opinion? -Hua Moa - Sounds like it grows fast. -dwarf cavandish - Tried and true. Sounds like an easy variety. -ice cream banana - Novelty, I'm sure but sounds fun to try. Temperate Fruit Discussion / 'Bing' cherry blooming in fall?! Hello! I've seen a lot of talk in this forum about Pawpaws and I've been interested in them for several months now. 1) Will they grow well in my area? I am in zone 9b. Locally we grow alot of stone fruits in my area so chill hours should be ok? 2) What are some good varieties to grow? I've seen discussion about some tasting like mangos, others like banana, etc. I personally prefer banana, but the wife loves mangos. 3) Can they be maintained in a pot? 4) Sourcing: would anyone have seeds come late winter/early spring to try? I'm at my limit for what I can germinate and keep warm for the winter here. Tropical Vegetables and Other Edibles / Best cure for Powdery mildew? My pumpkins and goji berries recently got some pretty heavy powdery mildew, what are your experiences with remedies? Should I use a fungicide? Baking soda/oil/soap? Neem oil? Citrus General Discussion / Advise me citrus masters! Was on amazon today and saw osmocote is on sale. $15 for 8lb bag. Just an FYI, I know alot of people here use it. Tropical Fruit Discussion / JoeHewitt!! Show us your place! I love Bills videos, he's always so excited about everything he does. 40 acres? overlooking the bay? Will you be documenting this project? I know I'd love to see it! Tropical Fruit Discussion / Guavas in Nor Cal? 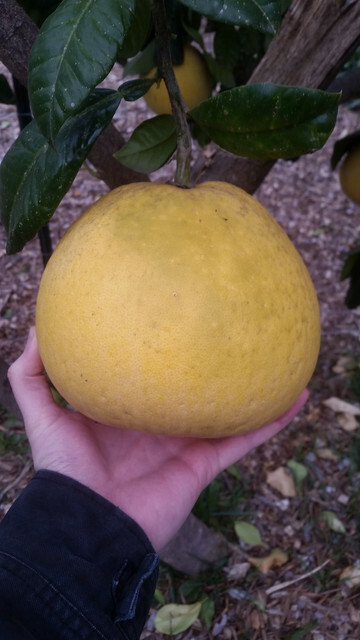 Can you grow Guavas in northern California 9B? Preferably red varieties for juice. Are there any varieties that would be recommended for juicing? And are there any dwarfed varieties? I have some young seedlings (Mainly Eugenias, sapodillas, Mangos) That I am transferring outside as it's no longer 110 degrees outside. Currently they are under a raised bed I made for strawberries but I will have more seedlings and I'm about out of room. Is there a good shade cloth I should look in to? Could anyone provide pictures of their setup? I don't even know what % I should be looking at. My back yard is facing east so it gets morning sun, but is usually pretty shaded by 5pm. Please send me a PM if you have seeds for miracle fruit and Moringa oleifera for sale. Which avocado should I get next? I have room for two trees. They will stay in pot until next season as I am going to start prepping the corner of my yard with wood chips. I need a tree that can stay fairly small, and is fairly cold tolerant. I'm in 9b. I currently have a hass. My local home depot has Bacon, holiday, lamb hass, mexicola, stewart. This is the largest selection I've seen in my area, should I try and order a grafted plant from a forum member or go forward with one of these? When is the best season to plant them? Should I plant after night time temps are 40ish after last frost in the spring to give them time to mature before next winter? Had a bit of a learning curve with some seeds so far, and not all are doing well, but it's a work in progress. 4-in-1 cherry. struggling a bit. Lost all green foliage on a graft recently. Same as last but also some muntingia calabura. I had alot of tip burn and started using water that's been sitting out for a while instead of straight from the tap, appears to be helping. Goji Berry. Not sure I like these too much. Reminds me too much of a tomato. Constructive criticism welcome. Like I said, I'm new to this so will take any advice. I lost alot of seeds (Including all my cherries of the rio:( ) but I now have them on a heat mat and in upside down plastic totes. Humidity is now kept around 70% and I'm noticing much better growth on some seedlings, though my camera doesn't show alot of it! I am looking to experiment with some plants and am looking to get some seeds or cuttings of many varieties. -Mango seeds. I have manilla and tommy (I believe) germinating now. Any recommendations on small fruits that do well in pots? Please let me know if you have any of these and are willing to share. Thanks!